After closing a case with the Brooklyn Police Department, Mary Handley is determined to become an official detective in her own right. And when Emily Worsham shows up at her new office— convinced her uncle John Worsham was murdered and desperate for answers—Mary's second assignment begins. Brooklyn on Fire combined two things I love: historical fiction and crime fiction. I LOVE the historical setting, the inclusion of historic figures, and how the mystery simply had so much twist and turns. Let me first tell you that Brooklyn on Fire is part of a series but can be read as a standalone. I've never read the first book but I still enjoyed this. The case that was tackled in the first book was briefly given background and it worked well for me. So now, let's talk about this book! I LOVE the historical setting. I like how it was well explored. Levy greatly explored the time period as he talk about not only of the place and time but also of prominent people present during that time. It may be bit overwhelming at the beginning but as I read on, these people just stuck with me.Aside from the people, the setting is also very interesting. I like how it revolves around a time period where sexism is rampant and our detective is a woman. Just how cool is that? I enjoyed Brooklyn on Fire's crime fiction aspect. It was thrilling and completely full of twists. It felt like Levy had pulled out several twists that I was so absorbed in this. Admittedly, though, I think that I would have guessed who started the chair of events if I was actually paying attention. When I was reading this, I would occasionally gasp out of genuine surprise. This book always catch me off guard. It has a lot of interesting turns throughout the crime solving. It's also very notable how the author would just play around and make you think that this person did it (but I guess that aspect is always there). Mary Handley is a strong lead. She's ambitious despite the unfortunate discrimination against women. She's also very stubborn and don't we all like that? Mary's stubbornness played a huge role in her solving of the case. Once she began something, despite the unfortunate things that happened, she simply pushed through it. There are, of course, still several factors that led to her strong will to find out the truth. But it's what I like about Mary. She's stubborn and very strong willed. She stands up for what she believes and knows how to keep calm throughout everything. There's also a tinge of romance. It was sweet and I really ship Mary and George Vanderbilt II. I love how their relationship started. I like how they still mind their own businesses yet still completely paying attention to what the other is doing. I like Vanderbilt's protectiveness towards Mary and how it ended up to him becoming Mary's 'employee' as they call it. 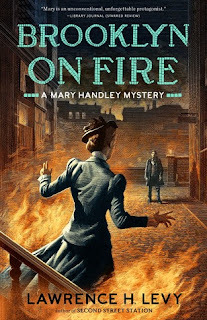 OVERALL, Brookly on Fire is a great combination of historical fiction and cozy mystery. The historical aspect is quite fact heavy particularly on the historic figures but still very tolerable to read especially if you enjoy the genre. The mystery is very thrilling and is always full of twists and excitement. Mary Handley is also a very great detective to follow and I'd love to read more of her. This is certainly a highly recommended read! [WEEKLY MUSING] Querna Dose Release Event!